George Frederick Nussbaum was born on 10 October 1876 in Niagara Falls, Niagara County, New York. Emanuel Gottlieb Nussbaum and Louisa Haeberle appeared in the US federal census of 1 June 1880 in Suspension Bridge, Niagara County, New York. Other members of the household included George Frederick Nussbaum, Charlotte F. Nussbaum and Emma Nussbaum. Emanuel Gottlieb Nussbaum and Louisa Haeberle appeared in the New York state census of 16 February 1892 in Niagara, Niagara County, New York. Other members of the household included George Frederick Nussbaum, Charlotte F. Nussbaum and Emma Nussbaum. He served during the Spanish-American War, according to the 1930 census. Emanuel Gottlieb Nussbaum and Louisa Haeberle appeared in the US federal census of 1 June 1900 in Niagara Fallls, Niagara County, New York, at 1641 Tenth Street. Other members of the household included George Frederick Nussbaum, Charlotte F. Nussbaum and Emma Nussbaum. He was a bookkeeper, according to the 1900 census. The following appeared in the Niagara Falls Gazette: The Rev. and Mrs. J. N. Simkins of No. 564 Fifth Street, announce the engagement of their daughter, Helen May, to George Frederick Nussbaum, the wedding to take place in St. Paul's M. E. church, Wednesday, October 28. The wedding of Miss Helen Simkins and Mr. George Frederick Nussbaum will take place tomorrow evening at 7 o'clock in St. Paul's M. E. Church on First Street. The Rev. Orville C. Poland will officiate. Miss Simkins will be attended by her sister, Miss Julia Simkins, who is to be the maid of honor. The maids will be Miss Ethel Robertson of Buffalo, Miss Mary G. Shepard, Miss Miriam T. Barron and Miss Mary S. Brown of this city, Miss Bessie Young and Miss Tompkins of LaSalle. Miss Alice B. Trott will preside at the organ and will give a musical programme preceding the ceremony ending with the bridal song from Lohengrin which will be sung by Miss Marie Rose as the wedding party enters. There will be a reception after the ceremony at the home of the bride's parents, the Rev. and Mrs. James N. Simkins of No. 554 Fifth Street, invitations to which will be verbal and will include the members of the two families only. Miss Simkins has been the guest of honor at several entertainments given by her friends. On Friday evening last the Misses Tompkins and Young of LaSalle, two of her bridesmaids, handsomely entertained the whole wedding party, and today after the rehearsal Miss Robertson and Miss Julia Simkins will entertain for Miss Simkins. He married Helen May Simkins, daughter of James Nelson Simkins and Frances Elizabeth Poyfair, on 28 October 1903 in Niagara Falls, Niagara County, New York, at St. Paul's M. E. Church. George Frederick Nussbaum and Helen May Simkins appeared in the New York state census of 1 June 1905 in Niagara Falls, Niagara County, New York, at 1371 Ontario Avenue. Other members of the household included Nelson George Nussbaum. Also in the household was clerk Roy Ames (age 29). He was employed as a salesman, according to the 1905 census. George Frederick Nussbaum and Helen May Simkins appeared in the US federal census of 15 April 1910 in Niagara Falls, New York, at 1371 Ontario Avenue. Other members of the household included Nelson George Nussbaum and Frances Louise Nussbaum. Also in the household was a female domestic servant. He was employed by a glass & paint company as a commercial traveler, according to the 1910 census. George Frederick Nussbaum and Helen May Simkins appeared in the Minnesota state census of 1 April 1915 in Niagara Falls, New York, at 1371 Ontario Avenue. Other members of the household included Frances Louise Nussbaum, Nelson George Nussbaum and George Frederick Nussbaum Jr. He was employed as a glass salesman, according to the 1915 census. George Frederick Nussbaum registered for the draft on 12 September 1918 in Niagara County, New York, while living with his wife Helen May at 1371 Ontario Avenue in Niagara Falls, and employed as a salesman by Pittsburgh Plate Glass Company at 372 Pearl Street in Buffalo. George Frederick Nussbaum and Helen May Simkins appeared in the US federal census of 1 January 1920 in Niagara Falls, New York, at 1371 Ontario Avenue. Other members of the household included Nelson George Nussbaum, Frances Louise Nussbaum and George Frederick Nussbaum Jr. Also in the household one boarder. He was employed as a salesman by a glass company, according to the 1920 census. George Frederick Nussbaum and Helen May Simkins appeared in the US federal census of 1 April 1930 in Niagara Falls, New York, at 1371 Ontario Avenue. Other members of the household included Frances Louise Nussbaum and George Frederick Nussbaum Jr. He was employed as a salesman by a plate glass company, according to the 1930 census. George Frederick Nussbaum and Helen May Simkins appeared in the US federal census of 1 April 1940 in Niagara Falls, New York, at 1371 Ontario Avenue. He was employed as a rep by a plate glass company, according to the 1940 census. George Frederick Nussbaum became a widower at the 24 May 1944 death of his wife Helen May Simkins. George Frederick Nussbaum died on 9 March 1952 at age 75 in Buffalo, Erie County, New York, at Buffalo Veterans Hospital. He was interred at Oakwood Cemetery, Niagara Fallls, Niagara County, New York. A former two-term member of the Niagara Falls City Council and well-known for many years in business circles, George F. Nussbaum, 75, of 1371 Ontario avenue, died at 4 p.m. yesterday at Buffalo Veterans hospital. 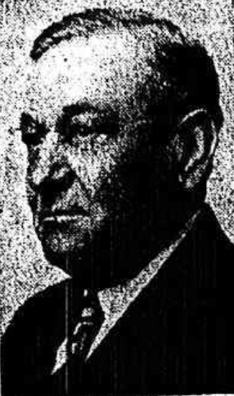 A native of this city, Mr. Nussbaum served as a councilman from 1928 to 1936 and during that period was one of the leaders in creating Hyde Park and the Municipal airport. For many years he was active in the Republican party. For a period of 47 years, prior to retirement, in 1948, Mr. Nussbaum was district representative of the Pittsburgh Plate Glass company. He was a veteran of the Spanish-American war and was a member of Niagara River Lodge 785, F and AM; Niagara Chapter 200, RAM; Niagara Commandery 64, Knights Templar; Ismalia temple, Buffalo; Exempt Firemen's association, Lewiston Anglers club and Niagara and Niagara Falls Country clubs. He is survived by two sons, Nelson G. Nussbaum, this city, and Dr. George F. Nussbaum, Jr., North Tonawanda; a daughter, Mrs. John H. Chapin, this city; a sister, Mrs. Emma Sonnenberg, Mt. Clemens, Mich., and eight grandchildren. Friends may call at the Gridley Funeral home, 750 Main street, until noon Wednesday. Funeral services will be conducted by the Rev. Arthur H. Schmoyer, at the convenience of the family. Interment will be in Oakwood cemetery.